With a focus on art responsive to instructions, input, or its environment, the exhibition FEEDBACK creates one possible narrative of the multi-faceted histories of w hat is now called "new media art". The exhibition picks up on and interweaves several strands of new media practice and their art-historical lineage. On the one hand, the title of the show points to the fact that the art presented in the exhibition is based on a process of feedback, responding to various forms of input and being affected again by the response. On the other hand, the title refers to the curatorial approach of taking a look back at arthistorical predecessors of art using digital technologies as a medium and exploring how the ideas addressed in these earlier works have moved forward in contemporary artistic practice. FEEDBACK weaves together two themes relating to "responsive" art. One theme traces the concept of feedback from "algorithmic" art based on instructions (natural language or code) to art that sets up open systems (reacting to outside or its own inputs), or global connections. The other explores the concept of light and the moving image from early kinetic and Op Art to responsive notions of television and cinema. These two themes are not meant to be understood as distinct "strands" but as interconnected narratives that intersect at certain points. The goal of FEEDBACK is not to create an inclusive historical survey, which would be beyond the exhibition's scope. Surveys of themes surfacing in this show, such as telematics or algorithmic art, have already been shown at other institutions. Examples would be Algorithmic Revolution (2004) organised by ZKM (Karlsruhe, Germany); and Telematic Connections - The Virtual Embrace (2001), curated by Steve Dietz, a travelling exhibition presented in several venues, among them the San Francisco Art Institute. Rather than attempting to be comprehensive, FEEDBACK features a selection of international works—representing key aspects of the above themes throughout time—and weaves them into a matrix that illuminates how these different artistic practices are interconnected and inform each other. The exhibition strives to avoid the construction of a static "historical" show and to create a network of connections that critically explores the role of responsiveness in relation to technologies and how the latter have changed cultural life and the social fabric. The works in the exhibition are not necessarily presented in chronological order but form certain thematic nodes that branch or connect to other sub-themes. Projects are also occasionally presented as pairs, highlighting the realization of a similar idea at different points in time. The concept of FEEDBACK —the process by which a system is modulated, controlled, or changed by the output or response it produces—forms the tissue that connects the diverse artworks brought together in the exhibition. FEEDBACK also means an evaluative response and the return of information about the result of an activity. On a more metaphorical level, the projects assembled in the exhibition function as a response to each other, returning information about their context to the viewer. While the reception of art always is an "interactive" event and involves a process of feedback, the exhibition focuses on art projects that are performative and go beyond the mental event of experiencing them. The works in the exhibition range from self-sustaining objects that rely on a closed system of feedback to systems with varying degrees of openness that receive input from instructions, the viewer, their environment, or information networks. Instructions and rules as a basis for creating art were an important element of art movements such as Dada (which peaked from 1916 to 1920), Fluxus (named and loosely organized in 1962), and conceptual art (1960s), which all incorporated variations of formal instructions as well as a focus on concept, event, and audience participation as opposed to art as a unified object. This emphasis on instructions connects to the algorithms that form the basis of any software and computer operation—a procedure of formal instructions that accomplish a "result" in a finite number of steps. Within FEEDBACK, algorithmic and instructionbased art is represented by different types of works, among them pieces by early pioneers— Charles Csuri, Manfred Mohr, and Vera Molnar —who started using mathematical functions to create "digital drawings" on paper in the 1960s. While the drawings themselves are not literally engaging in a process of feedback, their physical manifestation influenced further algorithmic variations created by their makers. Among the other early practitioners of "algorithmic" prints and drawings not featured in FEEDBACK were Bela Julesz, George Nees, and Frieder Nake whose works were included in the exhibition Computer-Generated Pictures at the Howard Wise Gallery in New York in 1965. The experiments of that time were an important beginning of the artistic investigation of more elaborate feedback processes. Instruction-based practice is closely related to contemporary generative art in which a process—such as a computer program, machine, or other procedural invention—is set into motion to create a work of art. These generative principles are at the core of C.E.B. Reas' Process series of which three pieces are included in the exhibition. Visually, the structures emerging from Reas' software programmes are organic and vaguely reminiscent of scientific images of cells and tissue. Reas' "software structures" explicitly reference the work of LeWitt and explore the relevance of conceptual art to the idea of software art. He writes text descriptions outlining dynamic relations between elements and then implements them as software. The structures are presented in different forms, including an automated version that generates itself; an interactive one that allows the audience to draw automated software elements onto a screen with their fingers, which then interact with each other, creating additional patterns; and an inkjet print derived from the software, which depicts the state of the process at a specific point. Together, the three different manifestations of the work capture different notions of feedback—a print produced on the basis of computer-generated drawing; software that generates itself on the basis of instructions; and software open to input from the audience. The series illustrates how an underlying "process" transcends the notion of medium. FEEDBACK further explores generative art in two related threads that connect "machine-driven drawing" with biological systems and artificial life and intelligence. Artist Roman Verostko has worked with softwaredriven pen plotter drawings since the late 1980s, and the exhibition features one of his pen plotters as well as an edition of books of drawings created in honor of the 19th century mathematician George Boole ). Boolean logic is a symbolic language that played a decisive role in the development of modern circuit boards and is also important to programming languages. Verostko and his wife Alice had investigated "the form-generating power of algorithms executed with computing power" since the mid-1980s and repeatedly found themselves returning to comparisons between biological processes and coded procedures. Referring to the concept of epigenesis—the process whereby a mature plant, the phenotype, grows from a seed, the genotype— Verostko developed the concept of "Epigenetic Art" (1988). The notion of the drawing machine surfaces in a very different way in 5voltcore's Shockbot Corejulio (2004), which consists of a re-engineered, "hacked" computer delivering electric shocks to its own graphics card and, in the process, producing images until it destroys its own output capacities. Highlighting the performative aspect of software, the project leads to a short-circuiting and "self-destruction" of hardware and redefines relationships between hardware and software components. The idea of machinic or automated production in connection to biological processes is picked up again in Harold Cohen's AARON (1973 - present) and Christa Sommerer and Laurent Mignonneau's Life Writer (2005), both of which explore computer code in relationship to artificial life and intelligence. For the past 30 years, Cohen's work has addressed the machine-based simulation of cognitive processes underlying the human act of drawing in his ongoing programme, AARON, which continuously generates drawings exploring possibilities of colour, form, and abstraction, as well as "automated aesthetics". Sommerer and Mignonneau's Life Writer, a continuation of their earlier project Life Spacies, on the other hand, uses the text typed in on a conventional typewriter as a form of genetic code that determines the movement and behaviour of creatures based on genetic algorithms. The letters typed in by visitors transform into artificial life "organisms" that seemingly "live" on the paper of the typewriter.Sommerer and Mignonneau have created a body of work that has explored the connection between physical and virtual life forms. A significant aspect of all these projects is the direct intervention in and communication with a virtual environment (and its inhabitants) that responds to the physicality of the human body. In different ways, the instruction-based and generative "drawing projects" in the exhibition all raise questions about the relationship of the artist to his work, artistic autonomy, and the possibilities of automated aesthetics. Instruction-based and algorithmic art is related to and interconnected with the conceptual art of the 1960s and 1970s, which was often rule-based and addressed communication theories, and "open systems". An example of conceptual art that references natural systems while questioning and dematerialising the art object is Hans Haacke's Condensation Cube (1963) , where a "biological system" triggers an ongoing condensation process within a (closed and sealed) Perspex box through light. Haacke's work picks up on the biological systems referenced in the pieces by Verostko, Reas, and Sommerer and Mignonneau, and at the same time raises issues about notions of the openness of systems. Condensation Cube is both a "generative" project and, at the same time, a closed system that —although transformative and not selfdestructive— relates to the closed system of Shockbot Corejulio. Both projects rely on input from within their own system and are not open to outside influences. While the "systems approach" during the late 1960s and the 1970s was broad in scope and addressed issues ranges from notions of the art object to social conditions, it was also inspired by technological systems. In the 1940s Norbert Wiener had pointed out that the digital computer raised the question of the relationship between the human and the machine and that it was necessary to explore that relationship in a scientific manner. Wiener coined the term "cybernetics" (from the Greek term "kybernetes" meaning "governor" or "steersman") to designate the important role that feedback plays in a communication system. In Cybernetics: or, Control and Communication in the Animal and the Machine (1948), Wiener defined three central concepts which he maintains were crucial in any organism or system—communication, control, and feedback—and postulated that the guiding principle behind life and organisation is information, the information contained in messages. While computers and digital technologies were by no means ubiquitous in the 1960s and 1970s, there was a sense that they would change society. In 1957, the USSR's launch of Sputnik at the height of the Cold War had prompted the United States to create the Advanced Research Projects Agency (ARPA) within the Department of Defense (DOD) in order to maintain a leading position in technology. In 1964, the RAND corporation, the foremost Cold War think-tank, developed a proposal for ARPA that conceptualised the Internet as a communication network without central authority that would be safe from a nuclear attack. Named after its Pentagon sponsor, ARPANET came into existence in the same year Apollo landed on the moon. In the 1960s-1970s artists interested in issues of media, computation, social networks, and communication theories used to be in active dialogue with their contemporaries probing other issues under the general guise of "conceptual art." ... Of course back then the issue wasn't about NEW media art, but the introduction of media art within established venues for contemporary art and the exponentially increasing impact of media and computer technology on the arts writ large. Questions commonly asked included: what exactly was the role of the arts in a technologically driven society? Are computers, consumer electronics and communication theory transforming art production or simply obscuring it? What was technology's relevance to art, if any, and did art operate under a technological imperative? Sound familiar? While these questions could have come from any one of the many new media art discussion lists, they were questions posed by Philip Leider, a founding editor of Artforum, as well as by other critics and artists in the pages of art journals and exhibition catalogs between 1962 and 1972. One of the obvious questions invited by Sutton's statement is why these discussions are not surfacing in Artforum today but predominantly unfold on mailing lists and in "new media theory". Conceptual art has found a safe place in the art-historical canon but its technological undertones, as they relate to today's new media arts, are still seldom considered. …transition from an object-oriented to a systems-oriented culture. Here change emanates not from things but from the way things are done. … A systems viewpoint is focused on the creation of stable, ongoing relationships between organic and non-organic systems, be these neighborhoods, industrial complexes, farms, transportation systems, information centers or any other of the matrixes of human activity. Burnham also applies the "systems esthetic" to the art market, using the term in a broader less technological sense. In "Real Time Systems" he compares artists to "programmes and subroutines" that "prepare new codes and analyze data in making works of art." Burnham's system has several layers and control structures: the activities of artists are controlled by "metaprogrammes", taking the form of "instructions, descriptions, and the organizational structure of programmes" and including art movements as well as the structures of the art world, business, promotional and archival. Today systems aesthetics are seen in a far more literal, technologically determined way, an example being the Internet as a system and information matrix. For Burnham, it was the art system as metaprogramme outlined above that created the illusion of art residing in objects and therefore led to dematerialisation: without institutional legitimation, the object would not necessarily be defined as an artwork but the art system can sustain the concept of art even without objects. This, according to Burnham, is the difference between hardware and software, as the "information processing cycle of art, books, catalogues, interviews, reviews, advertisements, sales and contracts can be recognized as the software extension of art". As he puts it, "the art object is, in effect, an "information trigger" for mobilizing the information cycle". Burnham's statement also applies to digital art but in this case the information processing cycle resides the artwork itself, which can be reconfigurable, participatory, generative and generates discourse on the network. Within FEEDBACK, Sommerer and Mignonneau's Life Writer functions as a transition point and link to further projects that are open to and rely on input from the viewer. Two works in the exhibition, Edward Ihnatowicz's SAM (Sound-Activated Mobile) (1968) and David Rokeby's n-Cha(n)t (2002), explore responsiveness to sounds generated by visitors. Exhibited as part of the groundbreaking exhibition Cybernetic Serendipity at the Institute of Contemporary Art in London in 1968, SAM was the first sculpture that moved in response to sounds generated by its environment. Consisting of aluminium castings— reminiscent of vertebrae and containing miniature hydraulic pistons—that support a flower-like fiberglass reflector with four small microphones, SAM was capable of moving from side to side and leaning forwards and backwards. Signals from the four microphones were used to determine the direction of sound input and would make SAM move in the direction of the sound input. Where SAM responds to sound with movement, David Rokeby's n-Cha(n)t addresses sound input from the audience on the level of language. Based on his earlier project Giver of Names, in which a computer system analysed physical objects put in front of a camera and made verbal statements about them by using associative processes, n-Cha(n)t is a networked community of Givers of Names. The system consists of seven computers equipped with highly focused microphones and voice recognition software and displaying a listening ear on their screens. The computer entities talk to each other and— driven by software that steers them towards finding resonance in synonyms and similar sounding words—finally reach a consensus and shared verbal association that makes them chant in unison. If a visitor speaks into one of the microphones, it distracts the respective entity, which communicates the input to its neighbours who in turn associate and lose coherence until the whole community of computers erupts in chaotic chatter. When left uninterrupted, the community slowly synchronises again and falls into the chant. n-Cha(n)t is an exploration of various levels of perception and interpretation and creates an anatomy of meaning as defined by associative processes. The project is a reflection on how machines "think" (and how we make them think). While SAM and n-Cha(n)t are based on (human) sound input to an object or system, another pair of projects establishes a visual connection and feedback system between participating viewers. With their participatory works from the 1960s, Brazilian artists Lygia Clark and Hélio Oiticica, made a significant contribution to developing interactive vocabularies that would be relevant to artists working with digital communications technology. Lygia Clark's Dialogue Goggles (1968), two connected diving goggles, force their wearers to literally face each other eye-to-eye and create a collision of vision and connection of bodies that is taken to a further level by Kazuhiko Hachiya's Inter Dis-Communication Machine (1993). Used by two people wearing head-mounted displays, the "machine" projects one player's sight and sound perception of a virtual "playground" into the other one's display, thus confusing the borders between "you" and "me". The Inter Dis-Communication Machine is reminiscent of the "Sim-Stim" device described in William Gibson's novel Neuromancer, which allows a user to "enter" another person's body and perception without being able to influence it. Another group of projects in the exhibition explores the concepts of feedback and openness with regard to games and play. While games have not necessarily been a wide field of exploration in earlier art forms, some of their inherent features connect to earlier artistic experiments. Both Marcel Duchamp (who was a chess player) and later on John Cage explored the elements of chance and randomness in the creation of their work, "rolling the dice" and investigating the structural effects of the unpredictable on a piece of art, as both aesthetic possibility and restraint. Robert Rauschenberg's Open Score (1966) —shown as part of the famous 9 Evenings performances by the group E.A.T. (Experiments in Art and Technology) and presented in FEEDBACK as video documentation—was a live tennis game played with rackets that had radio transmitters embedded in them. Every hit of the ball was accompanied by an amplified sound and the extinction of one of the lights in the auditorium, which finally enveloped the audience in complete darkness. The notion of "play" is an element of any performative and therefore any responsive art. By now, computer games have become an intrinsic part of pop culture and one of the most important areas of experimentation for new media artists. The technological history of digital art is inextricably linked to the military, industries, and research centers, as well as consumer culture and its associated technologies, and games can be said to epitomise the military-industrialentertainment complex. Eddo Stern touches upon these connections in Fort Paladin (2003) by embedding the game America's Army—used by the American army as a recruitment training game—into the sculpture of a medieval castle and writing artificial intelligent software trained to play and master the game. Juxtaposed with Stern's closed feedback system of a game playing itself, which also connects back to Shockbot Corejulio, is Mary Flanagan's [giantJoystick] (2006). Being highly participatory, Flanagan's work invites users to play classic arcade games by collaboratively moving on and controlling a 9-foothigh joystick (modeled after the 1980 Atari 2600 version). Interfaces, such as keyboards mice and joysticks, usually exist on the periphery of perception, as translators that extend users' hands and movements into dataspace. Flanagan highlights the spatial and social role of the interface by turning the joystick itself into a social sculpture and territory for inter-personal communication. FEEDBACK illustrates that the notion of systems and openness has substantially changed since the 1960s and that network technologies have played a major role in this transformation. Artworks addressing the notion of "open systems" in the middle of the last century could often only point to possibilities of openness in considering art beyond the confines of the museum and exploring societies, communities, architectures, natural processes as systems; or suggesting the openness of the art objects themselves. Even though the works frequently transcend the very notion of object, they still often manifest as objects in space. We tend to think of digital and particularly networked systems as intrinsically "open" ones, but openness can substantially differ from one artwork to the next. Although generative, most of the instructionbased drawing projects in the exhibition still rely on a fairly defined set of rules that is open to reconfiguration only by the artist. The amount of openness increases in projects such as Life Writer or n-Cha(n)t, where the rules of the software allow for new formations or associations. Both Haacke's Condensation Cube and Shockbot Corejulio can be understood as "informationally closed" systems that respond to their internal organization. The history of cybernetic projects that are activated by the viewer or respond to the environment continues in works that establish networks for broadcasting and participation. The Internet as information network opened up new possibilities for artists to establish frameworks that allow any participant to create and submit contributions to the system. It also provided new forms of agency by allowing people to have an effect in a remote physical location. Another networkenabled form of openness occurs in artworks that create interfaces and filters for understanding ongoing processes, such as exchanges on mailing lists. In this case the artwork is based upon but doesn't interfere with an "open system". The notion of communication networks as open systems forms the foundation of telematics -a term coined by Simon Nora and Alain Minc for a combination of computers and tele-communications in their 1978 report to French president Giscard d'Estaing (published in English as The Computerization of Society). During the 1970s artists started using "new technology" such as video and satellites to experiment with "live performances" and networks that anticipated the interactions currently taking place on the Internet and through the use of "streaming media". 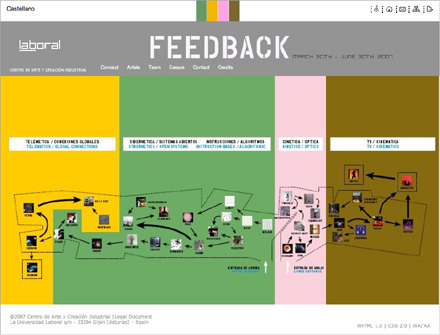 FEEDBACK features several pieces that each represent a different approach to telematics or networked art. While the field of networked art covers a broader territory than the works included in the exhibition, these works address some of the key issues of this art form. Paul Sermon's Telematic Dreaming (1992) is a classic of telepresence art that links two beds in two different spaces by means of a video conference link. A camera over the bed in one location sends a live video image of the bed and a person ("A") lying on it and projects it onto the bed in a different location on which another person ("B") can lie down. A live video image of the two people in bed together is sent back to a series of monitors that surround the bed with person "A". While telepresence is not a new concept, new technologies have allowed for unprecedented possibilities of "being present" in various locations at the same time. On a general level, the Internet can be considered one huge telepresence environment that allows us to be "present" all over the world in multiple contexts, participating in communication and events or even intervening with remote locations from the privacy of one's home. Telematic projects explore a wide field of issues, ranging from the technological "distribution" of our physical body, and networked community to the tension between privacy, voyeurism, and surveillance. In this context, Telematic Dreaming deliberately plays with the connotations of a bed as a private space and its psychological complexities. In contrast, Victoria Vesna's networked project Water Bowls (2006) explicitly addresses concepts of nature as they relate to the "connectedness" of the human condition, be it technologically or in the sense of interdependency with the environment. The Water Bowls installation first suggests a serene, contemplative space, with projections onto or through four bowls filled with water (and in one case, oil) that seem to extend the bowls in circular imagery appearing on the walls behind them. Engagement with the project, which is both locally interactive and can also receive input via a website, reveals layers of connections and connotations that disrupt or reposition any romantic notion of nature and point to environmental contamination or scarceness of resources. Connecting back to the closed water system of Hans Haacke's Condensation Cube, Vesna's project does not only allow remote intervention into the local "environment" via the Internet but also points to our natural environments as the networked system that changes with our input. Every aspect of our environment has been profoundly affected by centuries of civilization and our use (or exploitation) of natural resources. In different ways, both Clara Boj and Diego Diaz's Free Network Visible Network (2004) and Antoni Muntadas' On Translation: Social Networks (2006) strive to make the information transmitted over networks "visible" and interpret their content. Free Network Visible Network is an augmented reality project that overlays virtual information onto physical space and involves a mobile component. In the gallery, cameras project the image of a model of the LABoral Art Centre. Superimposed onto this image is a graphic visualisation of the network traffic on computers running the Visible Network software. People in the gallery can attach images, audio, 3D objects and text to the physical public space, which is visible in the projection and— through a Head Mounted Display (HMD) that visitors can borrow—within the exhibition space itself. Muntadas' Social Networks offers a different kind of data visualisation by sampling text from the websites of organisations ranging from Apple.com to Rhizome.org and analysing their vocabulary usage in terms of four criteria—economic, cultural, technological and military—and positioning the organisations in this context. In its move from instructionbased, generative and conceptual art to telematics and networks, FEEDBACK reflects on various models of open systems and their inherent characteristics. Another narrative thread within the exhibition establishes a connection between kinetic and Op Art works that employ motion, light, optics, and interaction for the creation of abstract moving images; video pieces based on input from the audience or the environment; and contemporary cinematic pieces that react to the viewer or construct a movie in real time on the basis of software or data from the Internet. Kinetics and Op Art used mechanics or light and optical effects to generate movement. In scientific terms, kinetic energy is the energy possessed by a body by virtue of its motion, and kinetic art, which peaked from the middle 1960s to the middle 1970s, often produced movement through machines activated by the viewer. Kinetic art overlaps with the optical art or Op Art of the 1960s, in which artists such as Victor Vasarely, Julio Le Parc, and Nicolas Schöffer used patterns to create optical illusions of movement, vibration, and warping. The term first appeared in print in Time magazine in October 1964, but works falling into the Op Art category had been produced much earlier. Duchamp's Rotary Glass Plates (Precision Optics), for example, which was created in 1920 with Man Ray, consisted of an optical machine and invited users to turn on the apparatus and stand at a certain distance from it in order to see the effect unfold. The influence of these pieces, such as László Moholy-Nagy's kinetic light sculptures and his concept of virtual volumes—"the outline or trajectory presented by an object in motion"—can be traced in quite a few new media installations. in Marcel Duchamp's Rotoreliefs (1965), part of the optical discs created from , moving discs with lithographic drawings transform into convex and concave objects suspended in motion; László Moholy-Nagy's film of his landmark project Light-Space Modulator captures the effect of light and pattern created by the motion of the original physical machine; and Alejandro & Moira Sina's Spinning Shaft (1978) creates a colourful light object through spinning neon tubes. A continuation of these historical works is Herwig Weiser's Death Before Disko (2005), a cylindrical Plexiglas object that creates a futuristic disco ball effect by means of LEDs, magnets, and magnetic fluid, oscillating to the sound of outer-space noises gathered from the Internet. While feedback in the early works is generated within the object itself, assisted by viewers' activation of a machine, the feedback process in Weiser's piece relies on input from a larger communication network. These optical pieces are juxtaposed with a group of sculptural kinetic works generating sound or exploring abstractions of the form and motion of organisms and human bodies. Takis' Musicale London (1965) is part of the artist's kinetic sound sculptures, which often made use of electro-magnetic and telemagnetic devices as a basis of aesthetic expression. Relating back to other pieces in the exhibition that reference biological systems, James Seawright's House Plants (1984) uses light input to "simulate" a natural process by making metal and plastic plant sculptures open and close. The abstraction of human form in Jean Tinguely's humorous sculpture Tokyo Gal (1967 / 1978)—consisting of an electric motor, a flywheel, radio parts and a feather—finds its continuation in Chico MacMurtrie's and Amorphic Robotworks' The Horny Children (2004). Founded by MacMurtrie in 1992, Amorphic Robot Works is a group of artists and engineers who have collaboratively produced robotic art performances and installations. Through the sculptures MacMurtrie strives to depict the most primal aspects of the human condition and create a "society of robots" that is built on and affected by technology. While there are obvious connections between art movements such as Dada, conceptual art, Op Art, kinetic art and today's new media art, it also would be problematic to neglect the specific historical context of the respective art forms and suggest that the motivation for their creation was the same. In his book From Technological to Virtual Art, Frank Popper outlines that contemporary virtual art is both a continuation and refinement of the technological art of the 20th century and a departure from it. Popper argues that today's new media art emphasises the philosophical investigation of the real and the virtual, has a combined commitment to aesthetics and technology, and is concerned with the relationship between science and society and human needs. Popper proposes that virtual art humanises technologies and provides new models for discussing humanist values in a technological age. Whether one agrees with Popper or not, there certainly has been a shift in focus: in kinetics, Op Art, conceptual art, the exploration of the aesthetic boundaries and status of the art object as well as its role in society were prominent concerns; contemporary new media art often emphasises the investigation of new technologies and the ways in which they have changed perception and societies. In the 1960s, art became more politically motivated and socially concerned, questioning the relationship of art to societies at large; today's new media art addresses its own status that cannot be disconnected from the politics of the media (industries) and access to tools, software, and networks. Picking up on the abstract imagery of optic art are several projects that incorporate elements of interaction in the medium of television—a form of experimentation that was pioneered by artists such as Nam June Paik and Steina and Woody Vasulka. Paik's Participation TV (1969), which invites viewers to become creators rather than consumers of television by speaking into a microphone connected to the TV set and manipulating the abstract patterns on the screen, is paired with Cory Arcangel's I Shot Andy Warhol (2002), a "hardware reengineering" of a different kind. Arcangel reprogrammed the chip for the 1980s Nintendo videogame Hogan's Alley and inserted easily recognisable iconic personalities into the game, resulting in a new manifestation of pop art genre. The remaining pieces in the exhibition take the moving image to a more cinematic level and explore different notions of feedback in the construction of the moving image. The cinematic aspect of gaming finds its expression in JODI's Max Payne Cheats Only (2005) in which the artist duo uses the game's "cheat codes"—usually aimed at making a game easier to play by providing an easy way through challenges—to reveal the "cheats" involved in the construction of the game's simulated reality. As a recording of the effects of the artist's code on the game and the resulting output, Max Payne Cheats Only deliberately removes the agency of the player and only hints at the feedback process underlying the game. Wolfgang Staehle's Ludlow Street (2007), by contrast, creates a cinematic feedback system through a live, streamed image of the street on which the artist lives. The project suggests a constantly evolving photographic image that becomes a continuous record of minute changes in every aspect of the environment. Input and output occur simultaneously on the level of image and technology and question the nature of representation in art itself. Does the live image render previous art forms obsolete? What role do the aesthetics of processing and mediation play in our perception of an artwork? In his previous work Empire 24/7 (1999)—an image of the Empire State Building streamed live over the Internet—Staehle explicitly referenced a previous artistic investigation of this subject, Andy Warhol's Empire, (1964) a seven hour long video of the Empire State Building. Digital interactivity is inextricably connected to the concept of databases, the possibility of assembling and reconfiguring media elements from a computerised record keeping system. Several artists, among them Jennifer and Kevin McCoy, and Thomson & Craighead, have explored the possibilities of the database for software driven cinema. Thomson & Craighead's Short Films about Flying (2003) is a networked installation and film projection that generates an open edition of unique cinematic works in real-time from existing data found on the World Wide Web. The imagery for each movie is coming from a Web camera and text is grabbed from a variety of on-line message boards, while randomly loaded net radio provides a soundtrack. Jennifer and Kevin McCoy's At Home (Traffic Series) (2004) takes a different approach to database cinema that picks up on the kinetic and machinic element. At Home is part of a series consisting of miniature models on a tabletop that represent both the artists' life and scenes from movies they have jointly watched. Suspended over the sets are dozens of miniature video cameras that capture images, which are then selected in a computer-controlled process and screened on the gallery walls. While the project, as Thomson & Craighead's one, relies on input from the artists' software, At Home reintroduces the physicality of the "movie set" and apparatus into the construction of the moving image. This notion of the cinematic apparatus prominently features in Marie Sester's Threatbox.us (2007) a large-scale installation using a computer vision tracking system and robotic video projector in which the movie frame literally tracks and attacks visitors. The imagery consists of a montage of violent scenes from films, news media, and computer games interspersed with scenes of people passively watching mass media entertainment in a domestic environment. Once visitors enter the computer's field of vision, the projected movie will swiftly move towards them and turn into a purple spotlight centering on their body and pursuing them. Referencing and critiquing the militaryindustrial-entertainment complex, Sester's project establishes a visceral connection between the image and viewers who provide input through their body movement and simultaneously become the target of the output, inserted in front of the camera. Notions of embodiment also prominently feature in Jenny Marketou's Be Careful Who Sees You When You Dream (2005), part of a series of projects involving large heliumfilled balloons equipped with cameras. The video cameras hidden inside the balloons continuously capture the surroundings, which are broadcast live on TV monitors inside the exhibition space. Visitors are invited to take a balloon on a walk, thereby building a connection between the exhibition space and its context and becoming both surveillor and object of surveillance. In a playful way, Marketou's project raises serious issues about the relationship between the recorded image and the spectator, surveillance, and the contemporary society of spectacle. Be Careful Who Sees You When You Dream addresses the technologically networked condition of contemporary society and the role of technologies of surveillance and recording in art and culture. The human body also plays a crucial role in the "cinematic" world of Char Davies' Osmose (1995), a classic of the genre of virtual reality environments. "Immersants" enter the virtual world by means of a headmounted display and a motion-tracking vest that monitors their wearers' breathing and balance and allows them to navigate through virtual landscapes. Davies avoids representational realism in the creation of her world, which— although not abstract—has an element of translucency and uses textures that suggest a constant flow of particles. Painterly in its sensibility, Osmose creates a myopic vision of a dream world. Where Marketou's project focuses on the recording of the outside world, Char Davies' piece seemingly inserts the participant in the simulated image world and makes breathing and balance the main form of input into the system. Illustrating a move from optical effects and kinetic mechanisms that create moving "images" to more technologised and networked processes of image production, this section of the exhibition explores the potential of feedback in expanding notions of movement and cinema. We are now confronted with complex possibilities for networked feedback systems that are unique to the digital medium and did not exist before or without digital technologies. FEEDBACK is an attempt to tell one of the possible histories of contemporary media arts and cultural production and to establish contexts for the evolution of digital art as a medium. While the exhibition can only present a snapshot of the complex evolution of new media, it strives to highlight some of the conceptual and historical complexities in the understanding of responsive art and the openness of systems from the 20th century onwards. Submitted by G.H. Hovagimyan on Wed, 2007-05-23 12:22. THe feedback exhibition is up until June 30th. If you are in sunny Spain check it out. If you want to write a report post.thing.net would welcome your take on the exhibition.